Complex Networks is a global lifestyle brand and media company, and one of the most influential voices in popular culture today. Complex Networks generates more than 1.1 billion video views a month across its digital channels – Complex, First We Feast, Rated Red, Pigeons and Planes, Sole Collector and more. Complex Networks is a Top 10 publisher in the U.S. for social engagement, and develops and distributes original programming for its channels and through output deals with distributors, including Netflix, Facebook, Fuse, Verizon, Snapchat, MSG and more. The company cultivates content that spans popular culture - from music to movies, sports to video games, fashion to food. Complex Networks may be best known for its video content, but the publishing side of its business – featured across seven websites – is equally as important. From its inception, the company was using a variety of content management systems (CMS) for different sites, each one with its own image management process – from a WordPress module to proprietary image libraries, like PHP GD or ImageMagick. All told, editors would typically have to create and upload as many as six different versions of an image per site, and oftentimes had to work with the development team to ensure the images were appropriate for the individual site – a process that could take up to an hour per image, with all the back and forth, to make changes, get the image approved and published on the CMS. Even with these processes in place, Complex Networks found that many of its pages weren’t optimized because some editors did not follow the standards, uploading images that were too large, which caused page load time to slow and impacted visitors’ experiences. As Complex Networks started to transition from a monolithic infrastructure to microservices and a serverless architecture, the company sought a more streamlined way to handle images across all of its sites. Using Cloudinary, 99 percent of the images are now automatically transformed and optimized, which frees editors from worrying about the various parameters for each image as it would appear on a specific viewing context. Editors only have to upload one version of an image, and all the necessary changes happen on-the-fly – adjusting to browser, device, viewport, and other parameters – through Cloudinary. Eliminating the need to create multiple versions of images, across a variety of CMS, streamlined the editorial workflow. Baksheyev estimates that editors and designers reduced the time it takes to upload and format images, and publish them on the CMS by 50 to 90 percent. Performance optimization ensured that page load time improved by up to 25 percent and engagement increased by 20 percent. The flexibility and features of Cloudinary also resulted in additional benefits for Complex Networks. Baksheyev said that during the sites’ redesign, managing images could create some artificial restrictions on designers, forcing them to stay within strict dimensions for content and media blocks. The fluidity of the Cloudinary solution enabled a more dynamic, creative design process that wasn’t hampered by many of these restrictions. Cloudinary’s flexibility also was evident in the company’s willingness to help Complex Networks address some of their unique requests. Working with the Cloudinary engineering team, they were able to tweak the image management process to add content-specific keywords while maintaining the original file names. Doing so ensured that images were properly indexed by search engines, improving SEO. 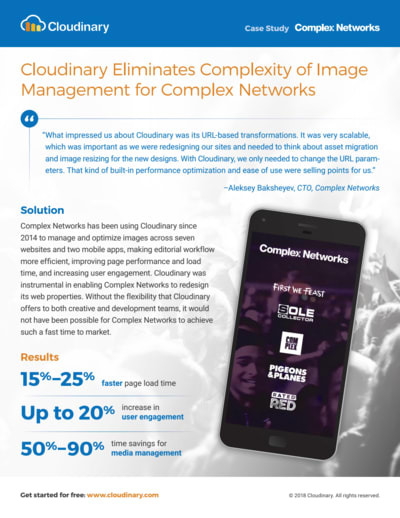 Cloudinary’s engineering team also helped Complex Networks integrate the image management functionality with its own content delivery network (CDN), which enabled the media company to maintain existing contracts with its CDN providers.